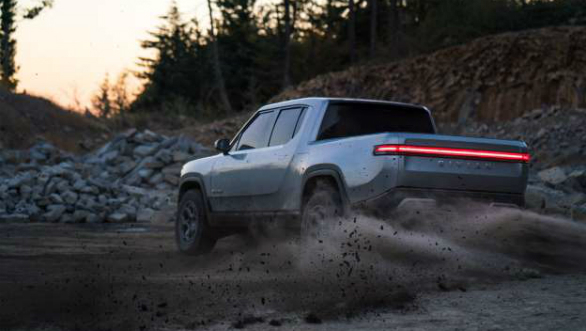 Rivian, an electric vehicle start-up form USA has announced its first proct, the Rivian R1T electric pickup truck. 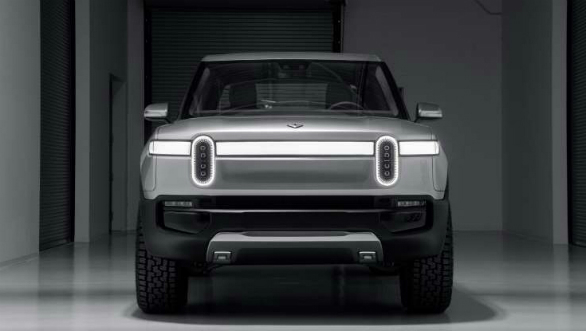 With this, the so far unknown copany wants to appeal to a set of EV customers who want a more lifestyle oriented product, unlike what Tesla has to offer. The company seems to have met this brief, at least on paper. The R1T is about the same size as a Ford ranger, the pick truck on which the Indian-market Endeavour is based on. It uses the boxy, space efficient design theme so common in US market pick-up truck but puts a futuristic spin on it. The flat front fascia is dominated by the full length LED light bar and vertical headlamps. There is significant cladding on the bumpers. The side profile is a bit more traditional, again following the boxy but with beefed up, squarish haunches. 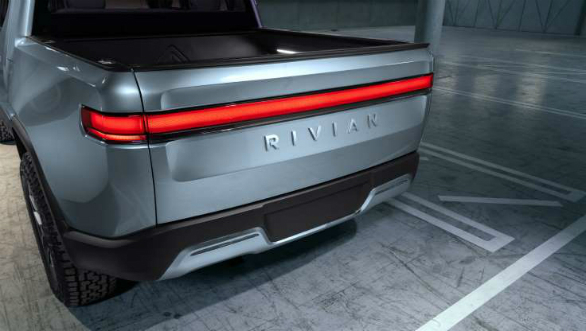 The rear mimics the design of the front, with the full length wrap-around taillamps. 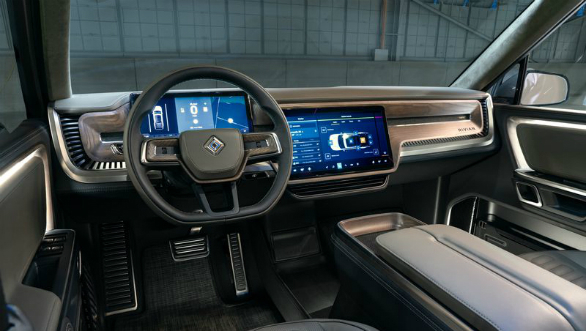 The interiors follow what is now becoming a norm for EVs. There is an airy feel to the cabin, the dash is minimal in its design and the space is dominated by the large 15.6 inch central touchscreen. The instrument cluster is another 12.3-inch screen. Rear passengers have access to the car's function via a 5.6 inch screen located below the rear air vents. 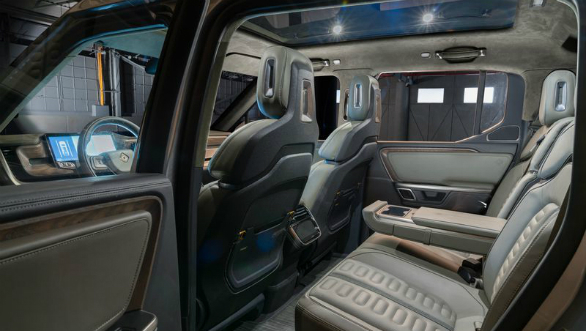 Innovative storage spaces can be found throughout the R1T. The load bay is flat and even has compartment beneath it to store a spare wheel. There is also a frunck (front boot) and an small, tunneled storage space between the rear doors and the flat bed. These have all been made possible given this car's EV architecture. The R1T sits on a skateboard like platform and has four electric motors, each powering one wheel and rated at 147 kW. There will be three battery packs on offer. The largest is 180 kWh and give the R1T a range of 645 km. The mid-sized 135 kWh pack will have around 490 km while the smallest 105 kwh battery pack will give it enough juice to do 370 km. The Rt1 can be fast charged up to 160 kWh. This gets it up 80 percent charge in 50 minutes via a DC fast charger. A level 2 charging station will take eight hours to charge it. All three versions have a top speed of 201 kmph. The mid-range 135 kWh battery pack is the quickest, rated at 754PS and 1,118 Nm, and having a 0 to 96 kmph time of 3.0s. The 180 kWh option is slighty slower, hitting the 96 kmph mark in 3.2s and making 700Ps and 1,118 Nm. The 105 kWh goes from supercar to sportscar fast, making 402 PS and 560 Nm, and gets from 0 to 96 kmph in 4.9s. More performance will be avai;b;e to user via OTa upgrades, much like Tesla. The R1T also has some serious off-roading chops to go with the styling and power. Air-suspension is standard and in its highest, off-roading setting there is 360 mm of ground clearance. Thee is 34-degree approach, 30-degree departure, and 26-degree breakover angles. The truck has a 800 kg payload capacity and can tow 4,990 kgs. Prices will range between $70,000 and $90,000. 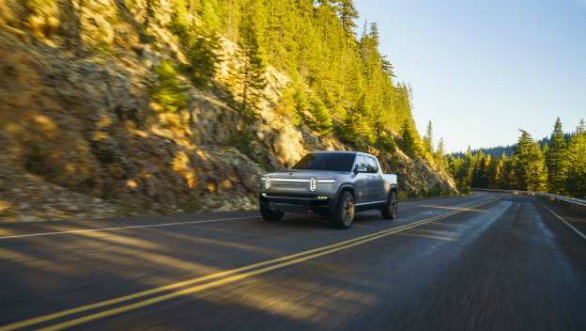 Rivian hopes to begin deliveries by late 2020, with the base version following 12 months after that. With EV startups coming up with promising conepts and then fading away, this firm stands out. Its idea is unique and in tune with the times. The product also seems well thought out so it seems to have a better shot at becoming a production reality. An SUV version of the R1T, the R1s is set to be unveiled shortly.